The Biosteps Gravity filter by Matala contains an amazing 200 sq. ft. of surface area for beneficial bacterial growth. Combined that with a cross flow design that traps and processes more debris at high flow rates and you get unparalleled mechanical and biological filtration for superior water quality. 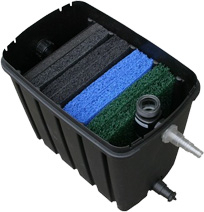 For ponds up to 2700 gallons. State of the Arts Progressive Filtration design enhances growth of different ecological communities of bacteria and planktonic organisms that colonize in different sections of the filter.